My many applications to Volunteer.gov bore fruit. I was accepted to be a campground host for the BLM (Bureau of Land Management) in Moab, Utah. My first offical day on the job was this past Monday, August 28, 2017. Technically, I am working as a volunteer for the U.S. Department of Interior. 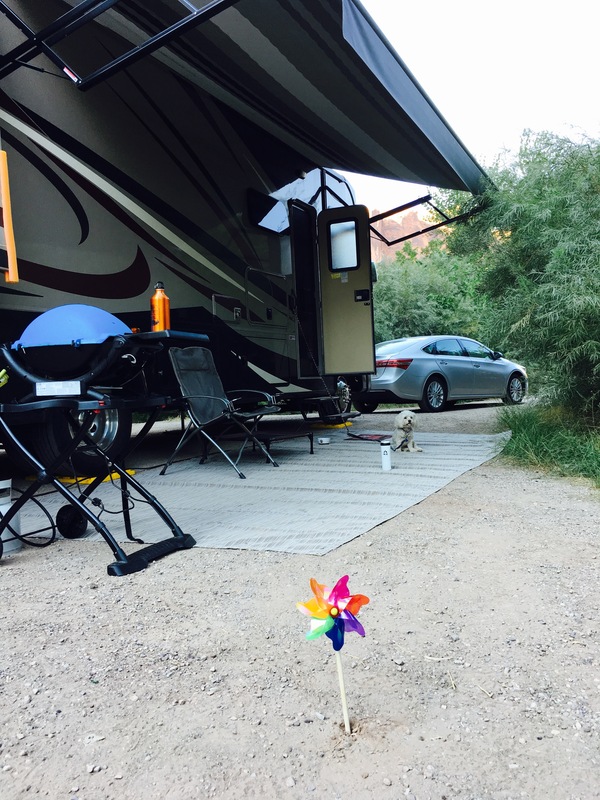 What is a Campground Host? This is the person who lives at the campground as a caretaker. Basically, I spend my day walking around two campgrounds with Aria. 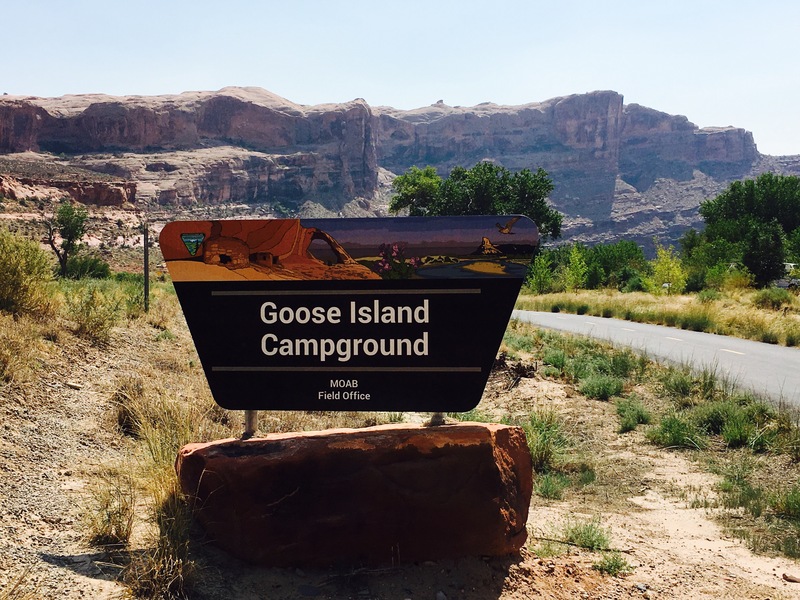 Goose Island Campground is where I am located and I also take care of Grandstaff Campground. I check each occupied site to encourage the campers to pay pay the $15 per night fee. I record the number of days each camper is staying to make sure that they don’t exceed their 14 day limit. Most stay one or two nights and then move on. I pick up any trash around the campground. So far there has been little to collect. I check the pay envelope box to make sure there are envelopes. I check the vault toilets to ensure there is enough toilet paper. I answer questions that the campers may have, and hand out printed material to augment the information I provide. The most important task I have is to relax. I work 5 days a week for 8 hours a day, I split the work day into two parts, morning and evening. Basically four hours in the morning and four in the evening. These are the times most campers leave or arrive. During the time between morning and evening, I am free to do as I please, I need to be available on weekends and holidays, so my days off will probably be Tuesday & Wednesday or maybe Wednesday and Thursday. I haven’t determined that yet. For this volunteer service I recieve a free campsite with a connection to dump my grey and black tanks (sewer) along with free water and ice at the BLM office in Moab. I am right by two National Parks (Arches and Canyonlands) and Dead Horse State Park along with numerous recreation areas. Arches National Park is just across the river from my campsite. My site backs up to the Colorado River. It is large an almost an L shape. Behind Tortoise (the motorhome) is space for a fire pit, picnic table and a bench. I use the bench as a place to charge my solar devices & lock up the bikes. Each night around 9 PM, I get serenaded by a boat tour on the Colorado River with the cliffs of Arches National Park lit up. However, I only get to hear about the pioneers & homesteaders and the land of opportunity… perhaps I should sign up for the tour to get the whole soundtrack. Aria loves walking the campsites. She greets everybody with a friendly wag of the tail. However, other dogs she is still getting use to. Some she barks at and others she wants to be friends with. We get to talk with all types of people. Some are lonely and just want to talk and talk and talk. I enjoy it. I am here until the end of October. If you are in the area, stop by and say hello. Wish I could come visit. Sounds absolutely awesome. Enjoy!